Join the book launch of A Time for Dragons (Anvil Publishing), edited by Vincent Simbulan, March 29, 2009 (Sunday), 3:00 pm, Shangri-la Mall Grand Atrium. And yes, there will be a parade of dragons. 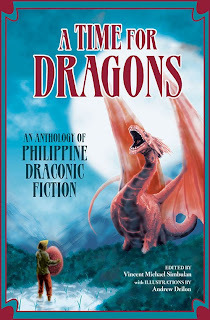 Accodring to Vin, this book is a collection of new dragon stories by Filipino authors to present the dragon in new and inventive ways, and renew and refresh the dragon for a more sophisticated and mature audience. The kickass cover and all interior art is by Andrew Drilon - and his original book art will be available for purchase at the launch.